Thousands of additional, hitherto unknown, migrant children were likely separated from their parents at the U.S. border for about a year before such cases became publicly known, according a U.S. government report released on Thursday, which also stressed the difficulties in identifying all the separated children. The report by U.S. Department of Health and Human Services’ Office of Inspector General (OIG) revealed that “thousands of separated children” were put in health department care until a federal court in June 2018 ordered the reunification of 2,600 separated children. “The total number of children separated from a parent or guardian by immigration authorities is unknown,” the report stated highlighting the “key takeaway” in its review. Following the June 2018 court order, the health department “has thus far identified 2,737 children in its care at that time who were separated from their parents,” it stated. “However, thousands of children may have been separated during an influx that began in 2017, before the accounting required by the court,” the report explained, adding that the health department “has faced challenges in identifying separated children”. A screenshot of the first page of the report titled “Separated Children Placed in Office of Refugee Resettlement Care” by U.S. Department of Health and Human Services’ Office of Inspector General. After initially certifying a list of 2,654 separated children to the court in July 2018, the ORR conducted formal reviews between October and December 2018 which added 162 additional children to the list but it also determined that 79 previously reported children had actually not been separated from a parent, arriving at the new total of 2,737 children in ORR care. The report revealed that U.S. President Donald Trump’s administration in all likelihood not only separated thousands of additional children from their parents and guardians than previously believed, but that such separations were enforced much before the policy was made public in April 2018. “Thousands of children may have been separated during an influx that began in 2017, before the accounting required by the court, and the health department has faced challenges in identifying separated children,” it stated. It was only in April 2018 that the Trump administration made its “zero-tolerance policy” for immigration offenses public and admitted that families were being separated at the U.S.-Mexico border. This led to a huge international public uproar forcing the Trump administration to end its family separation policy on June 20, 2018. A week later, a federal district court ordered the U.S. government to identify and reunify separated children with their families. 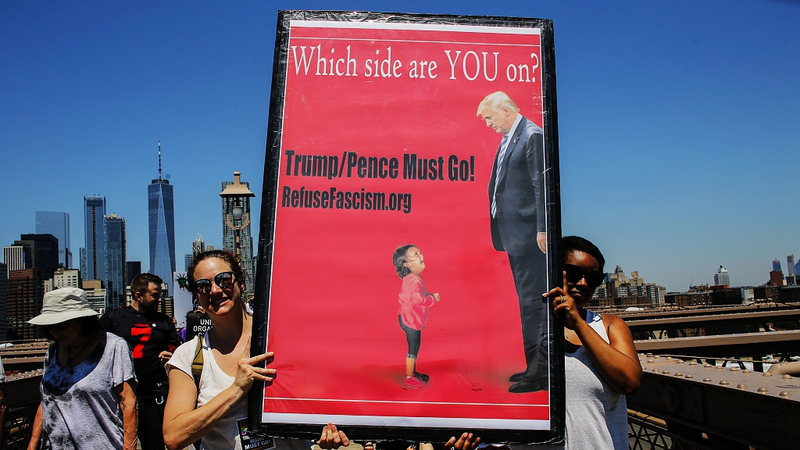 People take part in the nationwide “Families Belong Together” march to protest against the US immigration policies separating migrant families, in New York City, U.S., June 30, 2018. In the summer of 2017, about a year before the “zero-tolerance policy” became public, staff and officials at the health department’s Office of Refugee Resettlement (ORR) observed a steep increase in the number of children being referred to ORR care, who were separated from their parents or guardians by the Department of Homeland Security (DHS), the report said. Historically, these separations were rare and occurred because of circumstances such as the parent’s medical emergency or a determination that the parent was a threat to the child’s safety, the report elucidated, adding that ORR is not a law enforcement agency and has no role in the decision to separate families or prosecute immigration law violations. Concerned by the unusual spike in the number of such separated children, ORR officials started “informally tracking separations”, which subsequently revealed that “the proportion of separated children rose from approximately 0.3 percent [of all children in ORR care] in late 2016 to 3.6 percent by August 2017,” according to the report. Officials estimated that thousands of separated children entered ORR care and were released prior to the June 2018 court order. The report acknowledged that the tracking systems in use at that time were informal and designed for operational purposes rather than retrospection reporting, and therefore ORR was unable to provide a more precise estimate or specific information about these children’s placements. Questioning the findings of the OIG report, DHS spokesperson Katie Waldman, however, asserted that it “vindicates” DHS’s contention that the U.S. government has been for years separating children from parents with criminal records or other incriminating evidence of them being a danger to the country. 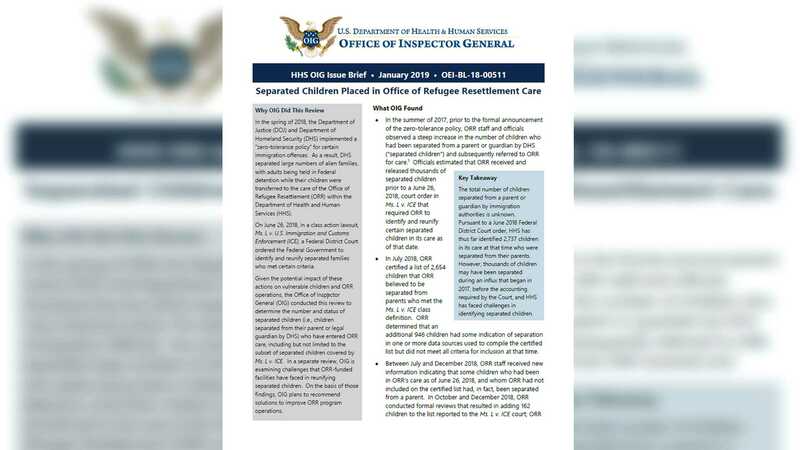 Health department spokeswoman Evelyn Stauffer meanwhile praised “the herculean work” by the ORR staff in bringing out the OIG report in an attempt to identify separated children in its care and reunify them with their parents.